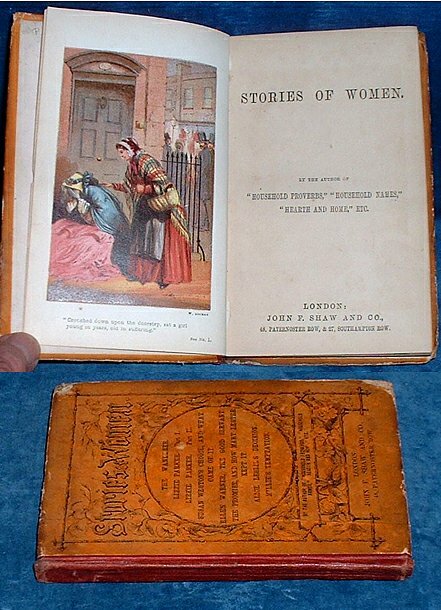 Title: STORIES OF WOMEN by the author of "Household Proberbs," "Household Names," "Hearth and Home," etc. Description: London, John F. Shaw and Co. 1864 (publisher's catalogue) Colour printed frontispiece by W. Dickes, large circular vignettes to each of 8 titles. . 160x102mm cloth spined printed & decorated orange boards (edges quite worn but spine sound) 8 tracts separately paginated & each with a pictorial titlepage and 16 pages of text. Titles numbered from 1 to 8. At the end a 16pp catalogue of Shaw's tracts & books on social and moral subjects and an 8pp catalogue of educational books. This listed in the catalogue as being "A new series of Tracts" though titled as "Stories FOR Women" the individual tracts are listed and all are the same titles as in this book. Quite scarce with Cambridge the only library noted as having this.